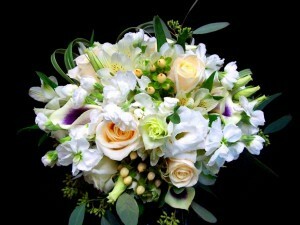 Whoever said an all white bouquet was too plain hadn’t seen this hand tied bouquet. 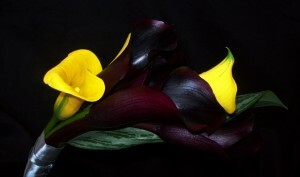 The secret is the variation in texture (and a hint of purple – deep inside the Picasso Mini Calla Lily). A majority of the volume is created with White Alstroemeria and White Lizianthus. White Stock provides a sweet fragrance with Vendela Rose and ivory Hypericum Berries warm the palate. 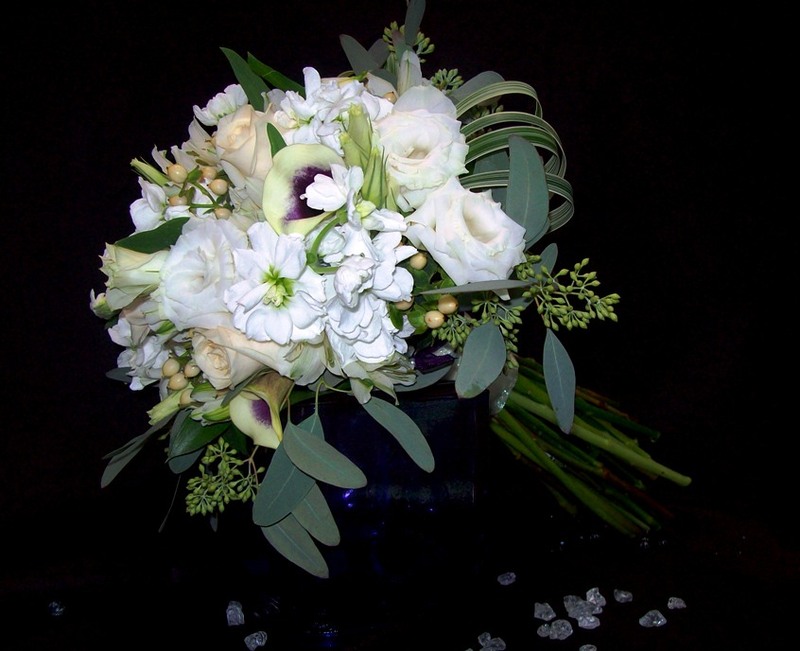 Seeded Eucalyptus and clustered loops of lily grass finish the bouquet with a subtle collar of soft green. 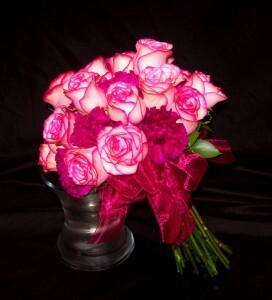 Beautiful two tone pink roses are contrasted with fuschia dianthus (carnations) in this sophisticated hand-tied bouquet. 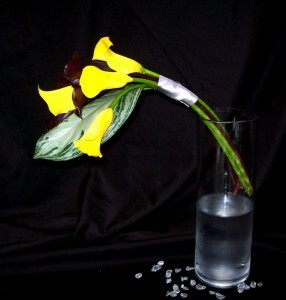 These bright yellow Mini Calla Lilies are balanced with the nearly black Schwarzwalder Mini Calla in this sleek and stylish handtied bouquet. A twist on the traditional bridal cascade. Mango Mini Callas, James Storei Orchids, Circus Roses, Hypericum and Red Alstroemeria with gold wire clusters and rattan reed loops. 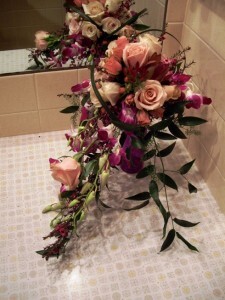 Let us create a custom bridal bouquet for you! On Saturday members of our design team traveled to the Illinois State Florist Association Spring Conference. We attended lectures and hands-on workshops to help hone our skills and learn about changes in the floral industry in topics from corsages to cascades, customer service to custom silks. This bouquet was just one on the projects we worked on at our hands-on workshops. This slender and stylized cascade bouquet is perfect for the bride who wants to set herself apart. Neutral Sahara and Sandstone roses balance the bolder tones of the purple dendrobium orchids. 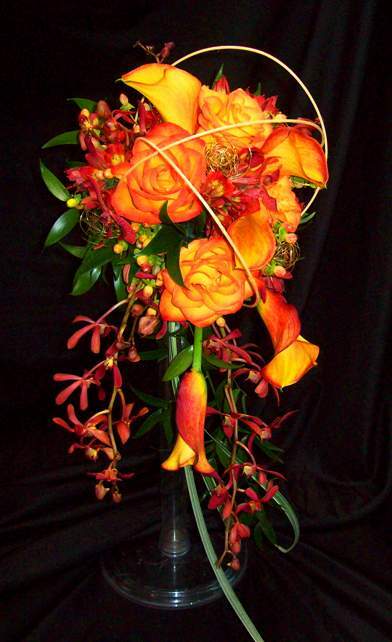 Hypericum berries, spray roses, and leucadendron and lily grass add depth and texture.